I had heard amazing things about Ojon but felt it was a little pricey but when I received the Instant Restorative Hair Serum in a Glossy Box I was very excited to try it and then got a few other products to try too! The packaging of the Instant Restorative Hair Serums nice and I like the dropper applicator. I must admit that I spilt this a good few times so although it looks basically empty most of it ended up on my dressing table. The top of the bottle is easily knocked and I would always forget to screw the lid back on as I rushed to rub the oil into my hair. 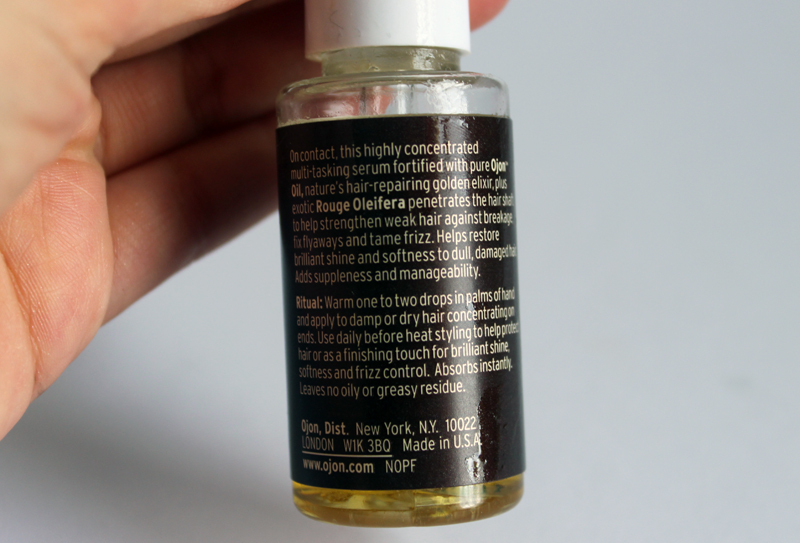 I love hair oils and I think this is a really nice one, I applied a few drops to the end of my damp hair and it left it feeling really healthy. I also used it a few times in dry hair just to reduce frizz slightly and although it does work to do that be very careful not to apply too much. At almost £20 for 50ml this product isn’t particularly inexpensive but it is cheaper than many oils out there and does a great job. I would particularly recommend this product if you are a heat addict and love to blow dry, straighten and curl your hair! I am a huge dry shampoo fan and the hairdresser had convinced me this was going to be great, maybe my expectations were too high but I just don’t like this product. My personal favourite dry shampoo is god ol’ Batiste but this one just doesn’t do the job of soaking up the oils (sounds nice, doesn’t it!?) and doesn’t leave my hair feeling much cleaner than without this product. My biggest problem with this product though is the scent- to me it smells of curry or when you mix lots of perfumes together and they begin to just smell horrible! Saying that I know some people do like the scent but this product just isn’t for me. At a crazy £16.20 I will be sticking to Batiste! This was possibly the product I was most excited for although I don’t typically use hair treatments especially not like this one. Inside the tub is a hard paste which you have to remove and than warm in between your hands, removing the product itself can prove quite difficult. I had to use the end of a pair of old tweezers and scrape it out which left the product looking rather ugly. You than warm it in your hands and it becomes a thick liquid which you than apply to your hair. I personally like to apply it just to my ends and unless you have very dry hair I wouldn’t recommend applying it all over, I then leave it from 20 minutes to over night and then rinse out. I like the product itself and having to warm it up in your hands but I did feel that you needed quite a bit of product. Once I rinse my hair my ends feel nice and healthy but the feeling doesn’t last for more than two washes and I feel the product doesn’t really penetrate into my hair but instead adds shine to the surface of the hair. Retailing at £29.25 its a rather pricey product and one I would only recommend if you have quite dry matte hair or want something indulgent rather than necessary. So rather mixed reviews about the Ojon products from me today- I still have the shampoos and a few other bits to try so watch out for that! What is your favourite hair care brand? Have you tried Ojon? i really need to try some of this stuff out.. my hair is in TERRIBLE condition! Ojon products are amazing. I wish my haircare budget was a little larger so i could splurge! 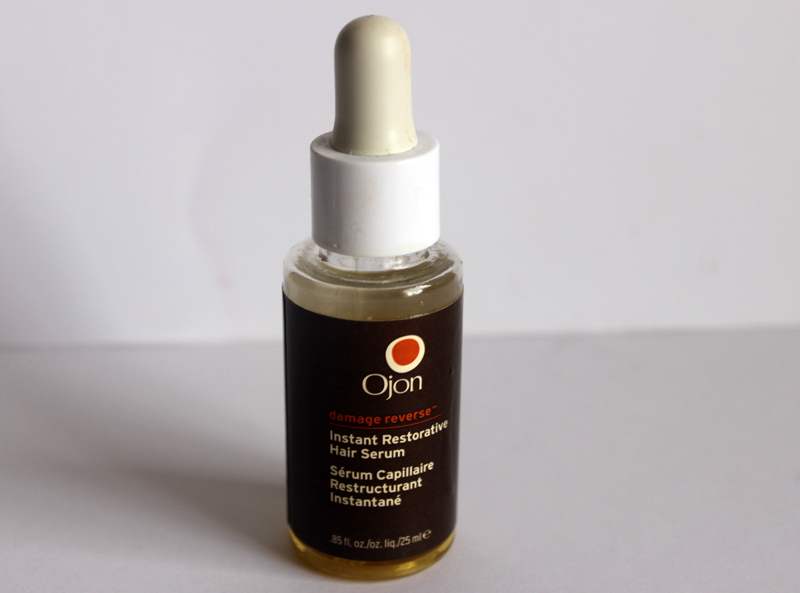 I love the ojon hair treatment, I use it once or twice a month and leave it in my hair overnight! The smell is so odd though! I just can't justify the price. The more you leave your hair be the better it is I feel, I'm going to try that route first! I like the look of the hair treatment. really wanting to try ojon, the products look great!